The beautiful handcrafted designs of Marco Bicego jewelry are instantly recognizable by the intricate golden twists and coils as well as the brilliant gemstones that reflect his perception of the world around him. Add a new twist and a pop of color to your wardrobe with one of his “candy coated” luxury jewelry styles. Marco Bicego is the son of a goldsmith from an Italian village outside of Venice. This area is a cultural mecca, rich in history and art. Marco’s father was a successful jeweler who specializes in handcrafting chains out of 18 carat gold. The family business inspired Marco to learn the art of jewelry making in the late fifties. The young jeweler apprentice worked especially hard to perfect the inner coil technique. The 18 carat gold inner coil, made of thick gold strands, is wound tightly with a gold thread. The coil is easily manipulated into most any desired shape. After years of working at it, Marco’s skill surpassed that of this father, and he decided to start his own line of luxury jewelry. Marco was a master of the inner coil technique, and it soon became his signature method, used in most of his designs. Marco’s style came together to show his love for beautiful detail and color intensity. He incorporated brilliant gemstones set against twisted, textured precious metals. Marco Bicego’s first collection was introduced in 2000 and America women fell in love with his bold, fresh look. You’ll love the look of his colorful rings, charming necklaces, fancy bracelets, and super sweet pairs of earrings. There are three features that make Marco Bicego designs so easy to spot! Marco combines an old-world craftsmanship with a modern twist and a pop of color, creating a style that is unmistakeable. His work is often characterized by intense multicolor gemstones, set in hand-engraved gold. Unique to the Marco Bicego brand is the hand-twisted coil chain made from 18K gold. 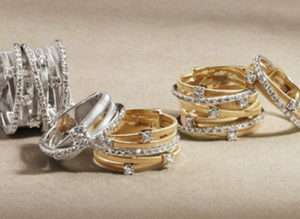 Marco Bicego designs include 18K yellow, white or rose gold. Marco’s vision is that jewelry must first be beautiful, and second it must be wearable. He prioritizes form, with function set as a close second. Marco Bicego jewelry is meant to be worn all day, every day. It’s versatility makes it appropriate for everything: from breakfast on the beach, to midday business meetings, to a formal charity dinner. When asked where his inspiration comes from, Marco says that he is inspired by nature and architecture that he experiences while traveling the world. He is also inspired by the woman who wears his designs. The customer he designs for is today’s modern woman who relishes in expressing her own style and individuality. She is bold enough to adorn herself by layering on multiple pieces. 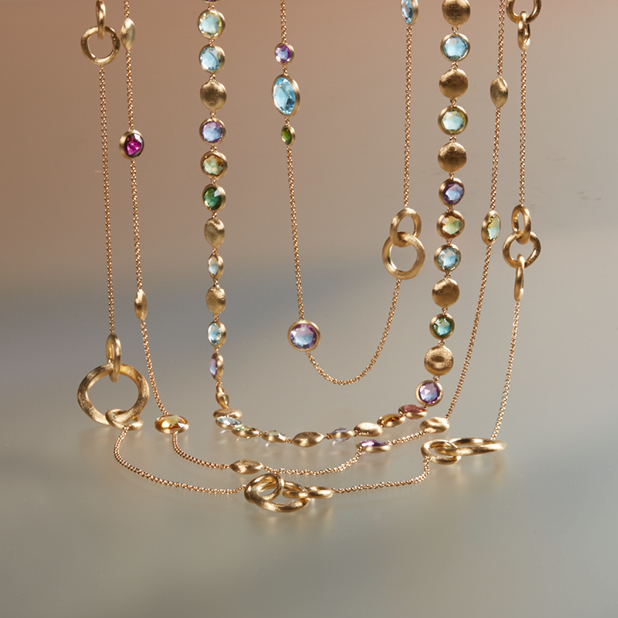 For that woman, Marco Bicego creates pieces that are beautiful to wear alone or layered. Stylish, confident women wear Marco Bicego jewelry. Hillary Clinton has been spotted wearing a necklace from the “Paradise” collection a number of times. Kyle Minogue loves the necklace and earrings from Marco Bicego’s Africa Collection. Rihanna was seen showing off semiprecious stone earrings from the Jaipur collection. The Duchess of Cambridge, lovely Kate, was photographed wearing her Marco Bicego necklace. Oprah was showing off Marco Bicego earrings on the cover of O Magazine in February 2014. Jennifer Lopez wears a stunning 18K white gold Rose Cut diamond bracelet from the Goa collection. This is a short but diverse collection of successful women of all ages, but the list could go on forever. Marco Bicego jewelry appeals to women of all ages and from all walks of life. With the profusion of multicolored stones and artistically twisted 18K gold, any woman can boldly walk with confidence. Jewelry designed by Marco Bicego is so versatile! Where would YOU wear it? Are you buying a gift or treating yourself? 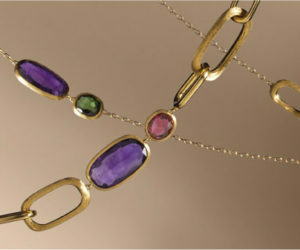 If you are looking for a special gift for a special someone, you cannot go wrong with Marco Bicego jewelry. Or, treat yourself to a new piece to accessorize your wardrobe next season! It has never been so easy to be fashion forward. Add a new twist and a pop of color to your look, and you’ll be rocking in Marco Bicego style.